Lately, I've been making cookies with Valentine's Day in mind. I've found the best way for us to have homemade cookies in the house (and not eat too many myself) is to freeze the freshly baked cookies. That way there is no, "They're going to go stale and I'll have to throw them out." excuses. If you've ever eaten a frozen Oreo or had a chocolate chip ice cream sandwich you realize that the quality really isn't affected much. You can let them defrost for a minute or two, nuke them for a few seconds or just eat them cold, which is what Alex and I do. Alex likes to dip his in cold Silk Soymilk. We had regular chocolate chip cookies in the freezer but that stash was getting low, so I added the two cookies you see above. There are chocolate heart sandwich cookies and lemon sugar cookie hearts with red sugar. The chocolate sandwich cookies came from a request from my husband John for Oreos with no dairy ingredients for my son Alex. I used a Martha Stewart recipe for the cookie. The melted Scharffen Berger semisweet chocolate and cocoa powder gave the cookie part a strong, rich chocolate flavor. I will definitely use that recipe again. For the filling, I mixed together 2 tablespoons each Earth Balance buttery spread and Spectrum shortening with a cup of powdered sugar (organic) and a 1/2 teaspoon of vanilla extract (fair trade). I think next time I'll try a caramel or marshmallow filling. But as an Oreo substitute goes they were pretty great! The other cookie is a lemon flavored sugar cookie that was inspired by one of Alex's favorite books, Nate the Great and the Monster Mess. In the book Nate is looking for his mother's missing monster cookie recipe and in the back there is a recipe for lemon Fang (a dog in the book) cookies. The night before we had read the book again. Since I didn't have any dog-shaped cookie cutters, we settled for hearts. The sugar cookie recipe wasn't anything to write home about but Alex really liked painting the cookies with egg yolk and food coloring 'paint'. We'll be using that again as a glaze for cookies or bread rolls. It was fun for Alex and the cookies came out nice and shiny. Today we went to Ann Arbor for a museum outing and on the way out of town we stopped at Zingerman's for bread and cheese to snack on for lunch. My favorite cheese right now is their "Detroit Street Brick". It's a truly divine combination of an aged goat's milk cheese studded with green peppercorns. The peppercorns have a beautiful floral quality that pairs so well with the tang of the goat's milk. I first tried this cheese in Traverse City this summer and absolutely fell in love. We also had some awesome mini pretzel loaves (dipped in lye water like real pretzels), aged goat's milk gouda and german hard salami. The salami/pretzel bread combo was perfect, it only needed a cold beer to wash it down. This week I have a pork shoulder to slow cook. I can't decide whether to make it as Carolina BBQ or try something completely new. Vegetables around here are looked pretty piqued this time of year. The only thing that looks half decent is the kale, which I love but I'm getting tired of. I can't wait for spring and the newer crops! I spent a good deal of the last week laying around sick. This was miserable but at least in between my fevered dozes I finished Alice Waters and Chez Panisse by Thomas McNamee. The first three quarters of the book were quite entertaining. Lots of discussion of the development of Alice Waters' personality and how different people influenced her and the restaurant. 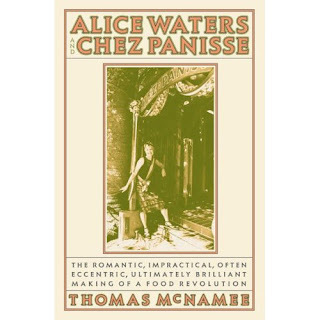 The final quarter was a sickeningly fawning account of Alice's causes and how truly fanastic an institution Chez Panisse has become. I would love to make a pilgramage out to the west coast and I still would love to try a meal at Chez Panisse but this isn't a book I'd be interested in revisiting. Since recovering I've been baking lots of bread and making Valentine's Day inspired cookies. I hope to post a few of my cookie experiments later this week. I think this is the best way to roast a chicken. The molasses ensures that it will have a deep, rich, caramelized/roasted flavor and awesome skin! This is my favorite way to roast chicken. It's great roasted in the oven or even better on a grill or counter-top rotisserie. The skin is to die for and the meat is always juicy and flavorful. Mix together molasses, oil, salt, black pepper, and garlic in a small bowl. Smear the inside of the chicken's cavity with ~1/3 of the mixture. Stuff the cavity with the fresh herbs. Smear the outside of the chicken with the remaining mixture. Truss the chicken, if desired. Roast the chicken until the temperature in the thickest part of the thigh reads 165 degrees F. For a small fryer start checking temperature after 45 minutes. Allow chicken to rest 10-15 minutes before carving. *I've used roasters (5-7 lb chickens) and broilers/fryers (2-1/2 to 5 pounds) with this recipe. Both work well, but when I want to use my rotisserie I'm stuck with the fryers because nothing else will fit. Of course cooking time will vary depending on the size of your bird. There can't possibly be too many food blogs out there. I certainly waste way too much time reading what other people are eating and cooking. So here it is...my very own food blog. Where I share what I've been cooking and what I've been eating. Of course along with what I should be eating, what I WANT to be eating and what Alex is refusing to eat this week. Hope you get some ideas or at least enjoy my ramblings.